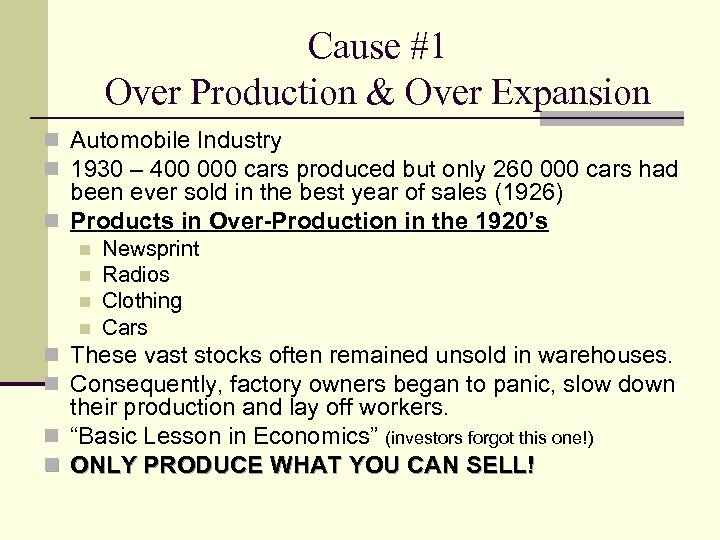 Cause #1 Over Production & Over Expansion n Automobile Industry n 1930 – 400 000 cars produced but only 260 000 cars had been ever sold in the best year of sales (1926) n Products in Over-Production in the 1920’s n n Newsprint Radios Clothing Cars n These vast stocks often remained unsold in warehouses. 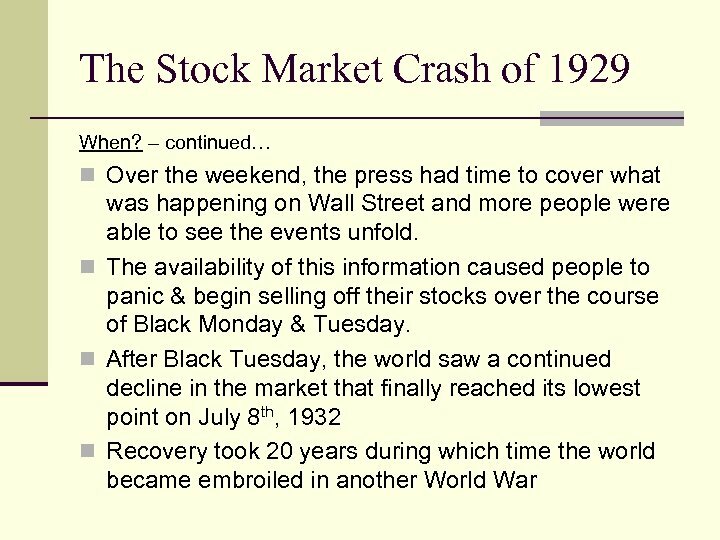 n Consequently, factory owners began to panic, slow down their production and lay off workers. 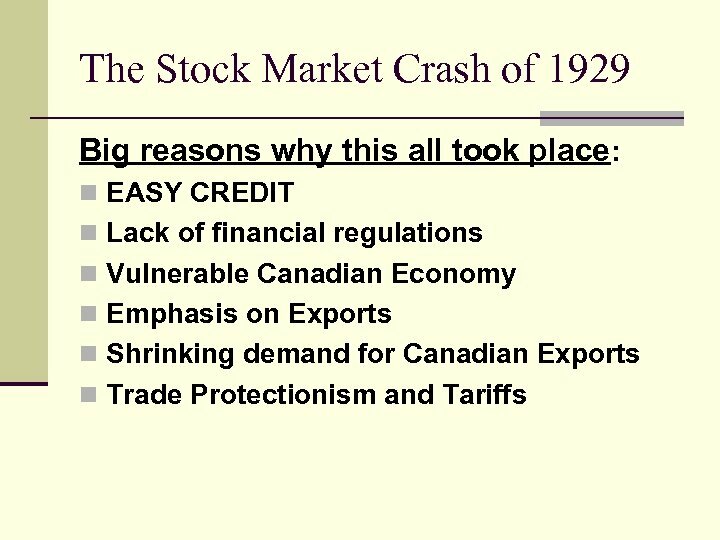 n “Basic Lesson in Economics” (investors forgot this one!) 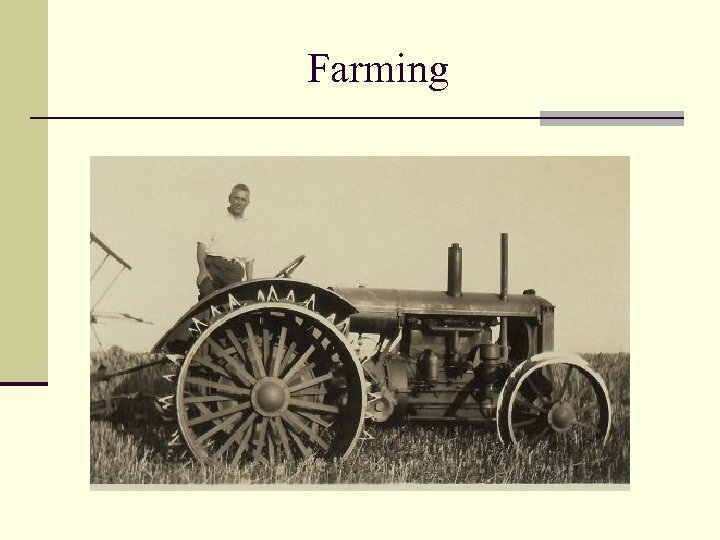 n ONLY PRODUCE WHAT YOU CAN SELL! 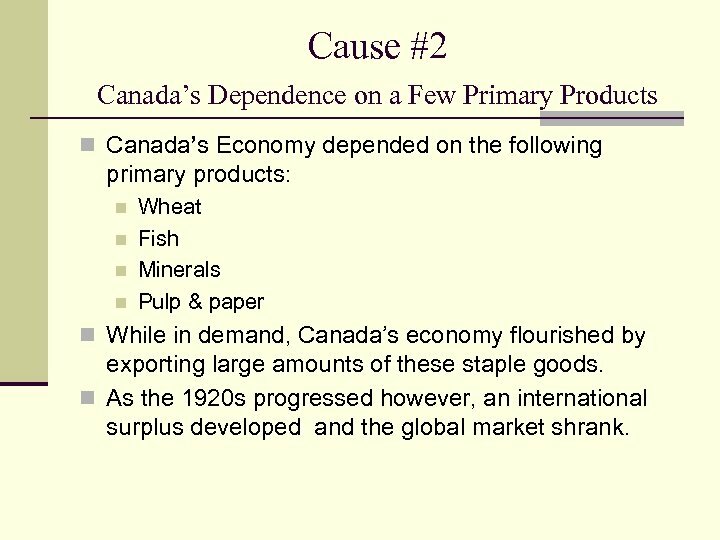 Cause #2 Canada’s Dependence on a Few Primary Products n Canada’s Economy depended on the following primary products: n n Wheat Fish Minerals Pulp & paper n While in demand, Canada’s economy flourished by exporting large amounts of these staple goods. 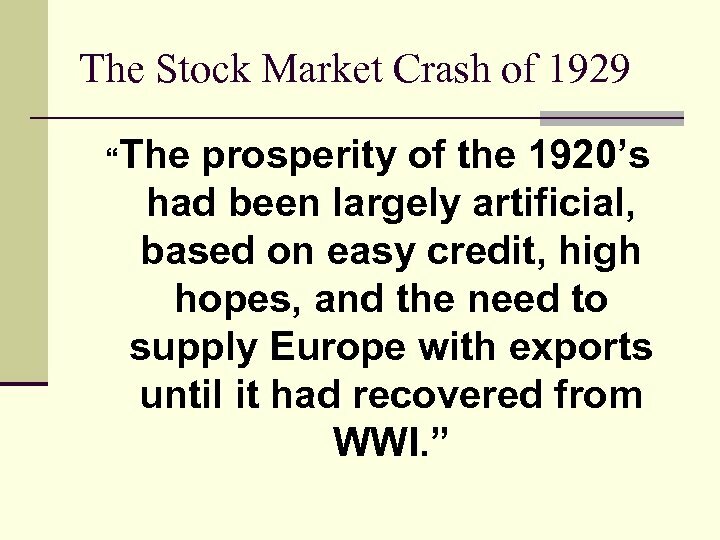 n As the 1920 s progressed however, an international surplus developed and the global market shrank. 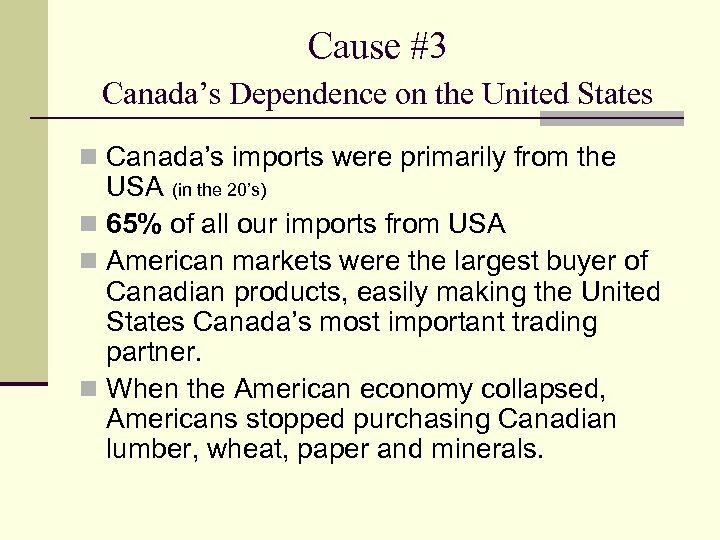 Cause #3 Canada’s Dependence on the United States n Canada’s imports were primarily from the USA (in the 20’s) n 65% of all our imports from USA n American markets were the largest buyer of Canadian products, easily making the United States Canada’s most important trading partner. 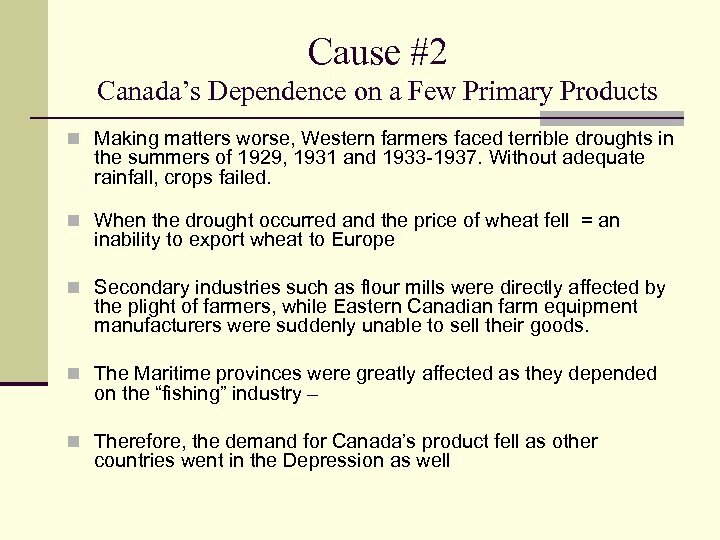 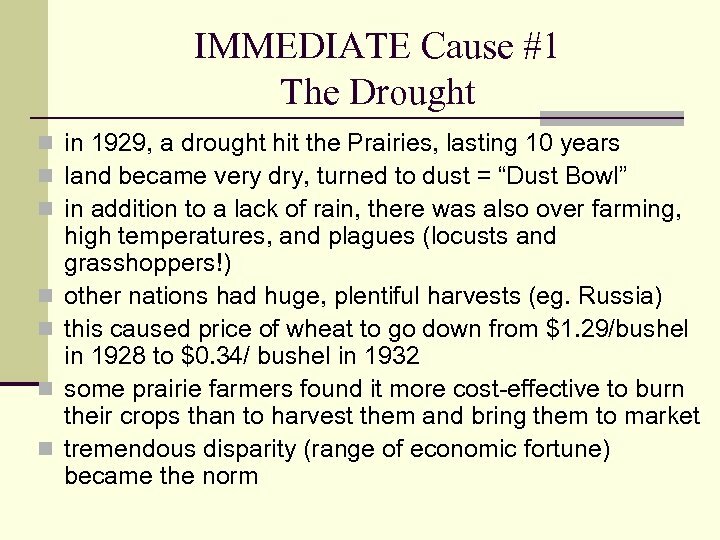 n When the American economy collapsed, Americans stopped purchasing Canadian lumber, wheat, paper and minerals. 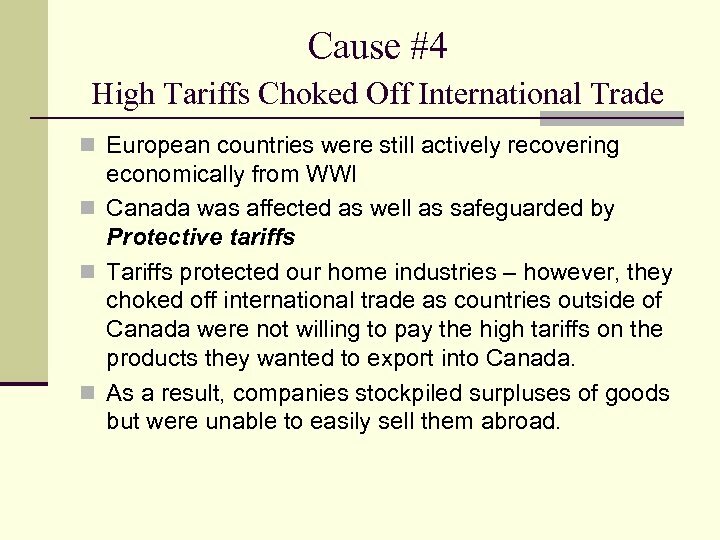 Cause #4 High Tariffs Choked Off International Trade n European countries were still actively recovering economically from WWI n Canada was affected as well as safeguarded by Protective tariffs n Tariffs protected our home industries – however, they choked off international trade as countries outside of Canada were not willing to pay the high tariffs on the products they wanted to export into Canada. 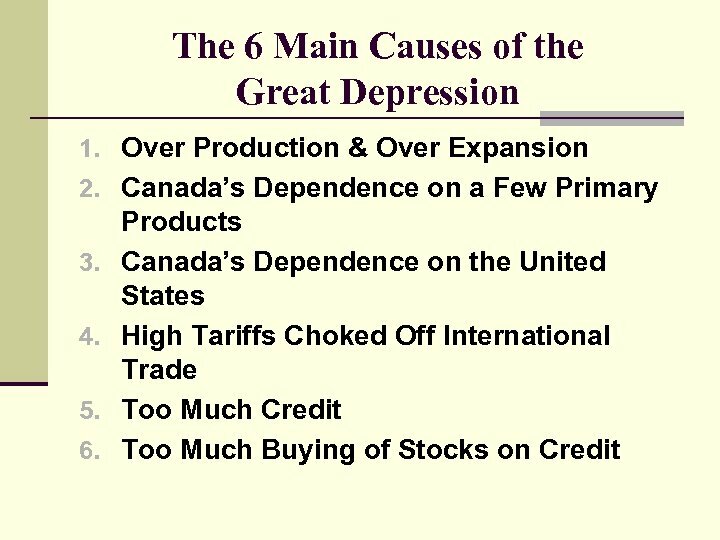 n As a result, companies stockpiled surpluses of goods but were unable to easily sell them abroad. 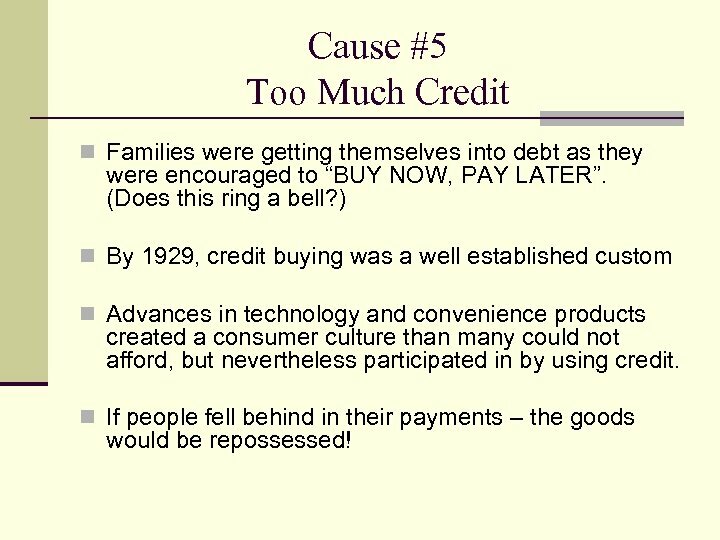 Cause #5 Too Much Credit n Families were getting themselves into debt as they were encouraged to “BUY NOW, PAY LATER”. 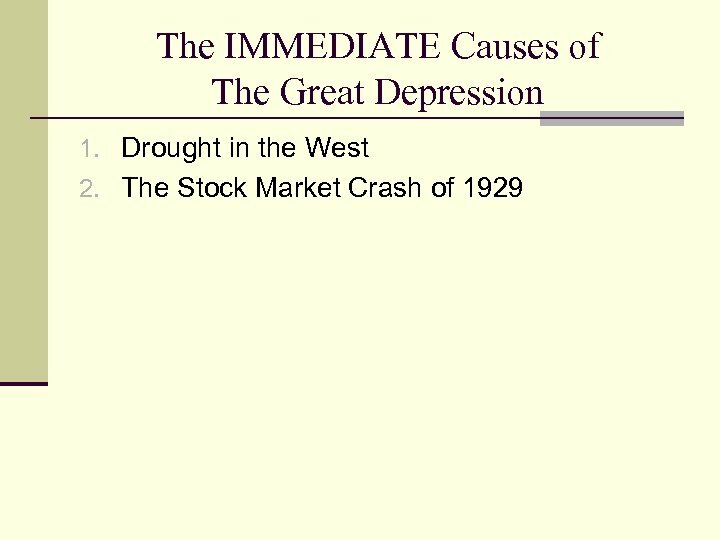 (Does this ring a bell? ) 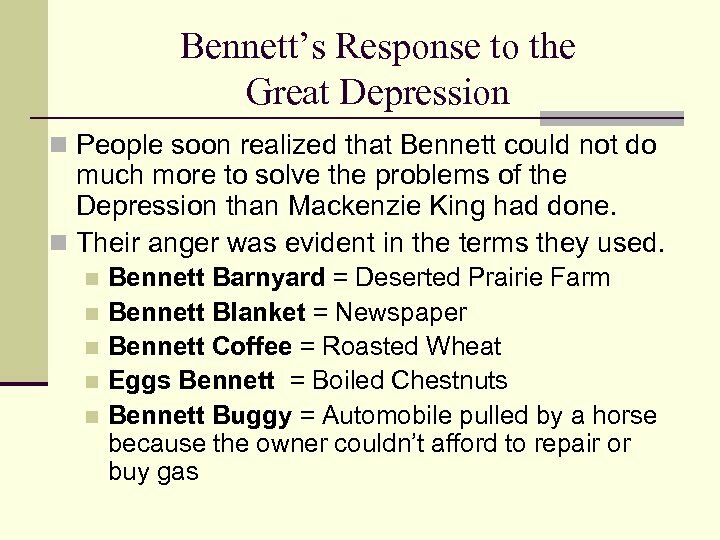 n By 1929, credit buying was a well established custom n Advances in technology and convenience products created a consumer culture than many could not afford, but nevertheless participated in by using credit. 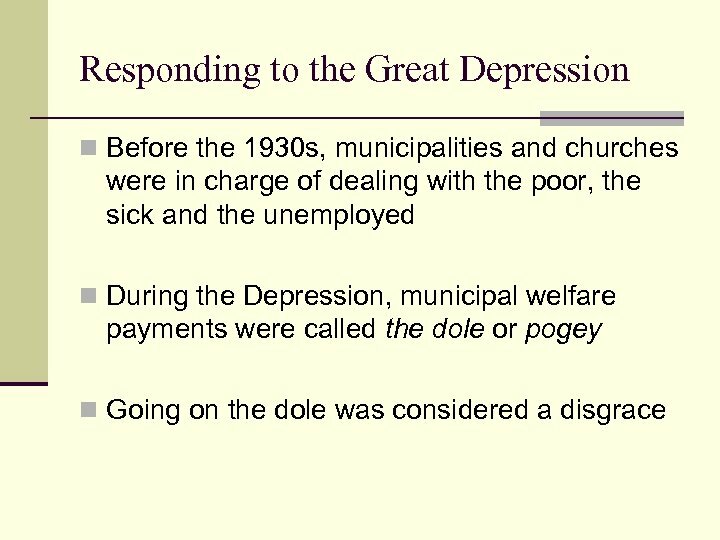 n If people fell behind in their payments – the goods would be repossessed! 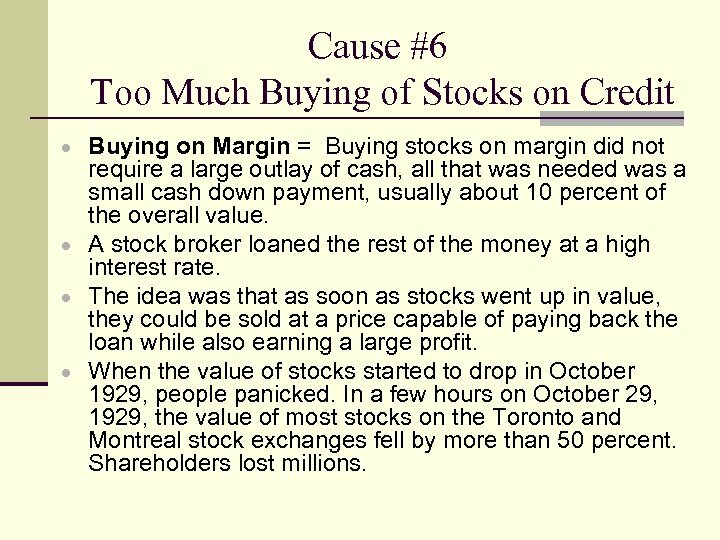 Cause #6 Too Much Buying of Stocks on Credit Buying on Margin = Buying stocks on margin did not require a large outlay of cash, all that was needed was a small cash down payment, usually about 10 percent of the overall value. 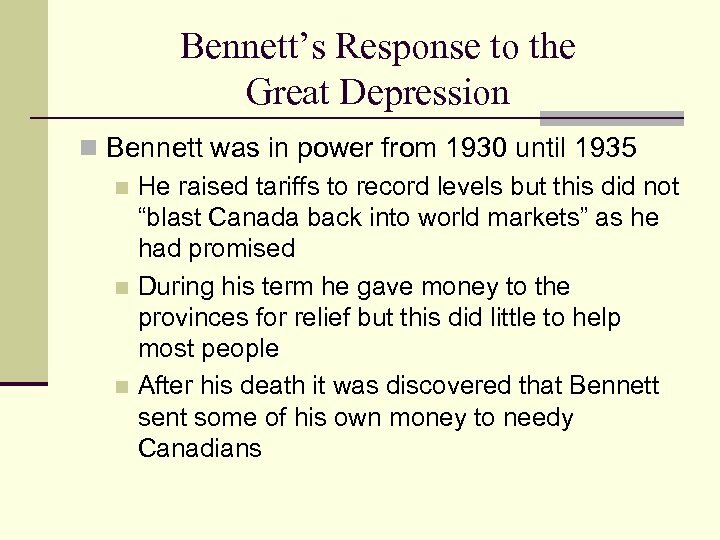 A stock broker loaned the rest of the money at a high interest rate. 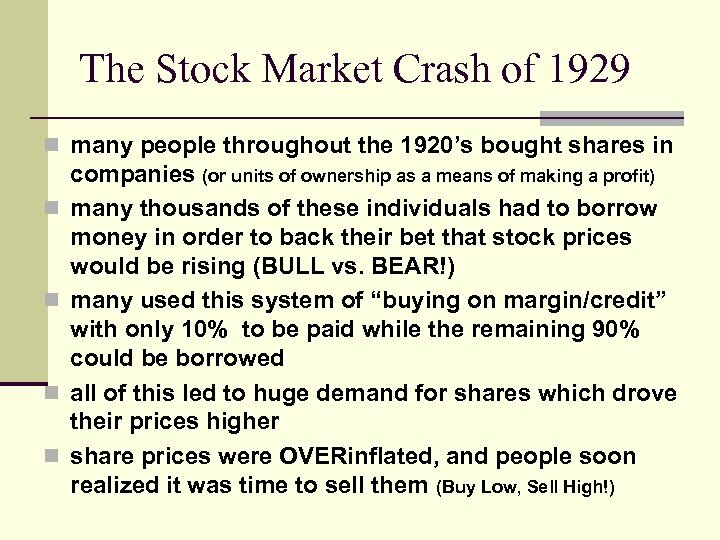 The idea was that as soon as stocks went up in value, they could be sold at a price capable of paying back the loan while also earning a large profit. 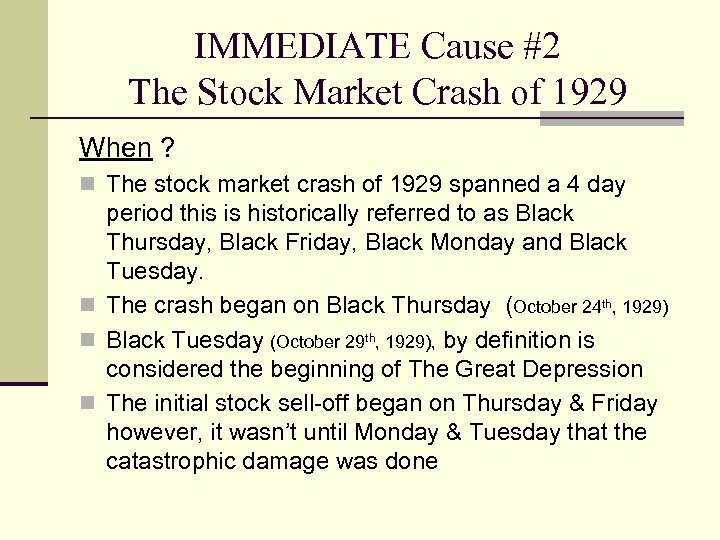 When the value of stocks started to drop in October 1929, people panicked. 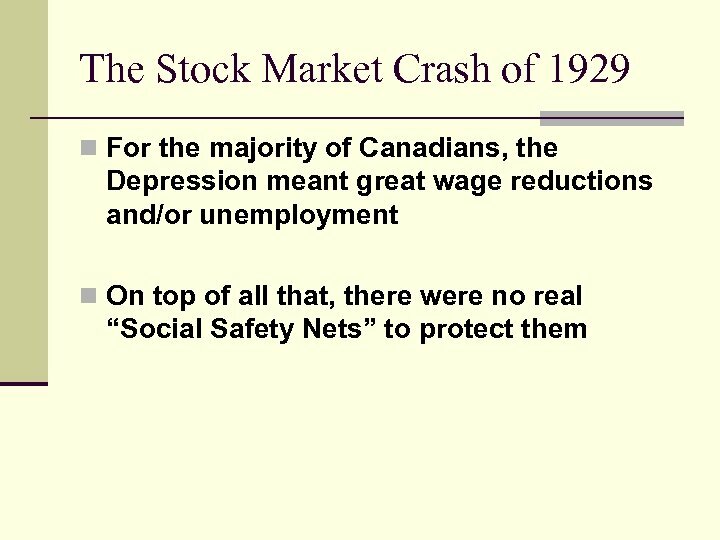 In a few hours on October 29, 1929, the value of most stocks on the Toronto and Montreal stock exchanges fell by more than 50 percent. 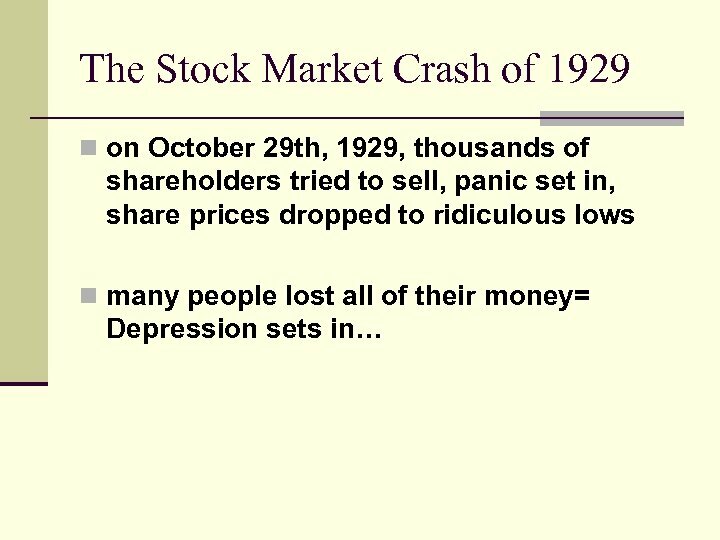 Shareholders lost millions. 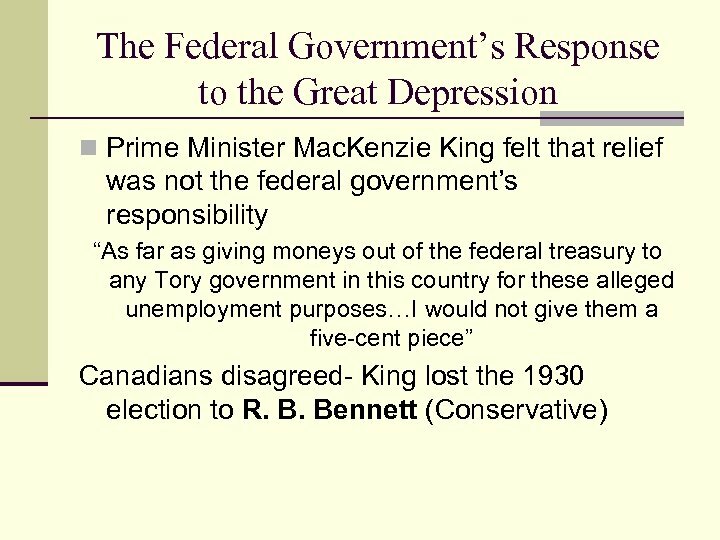 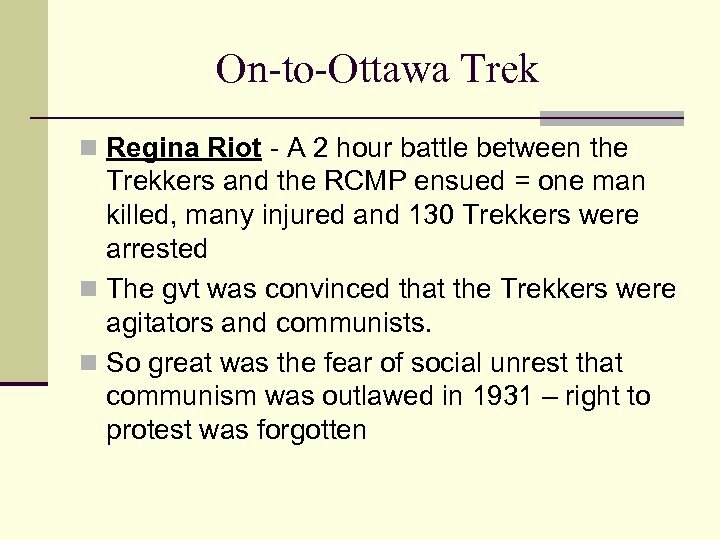 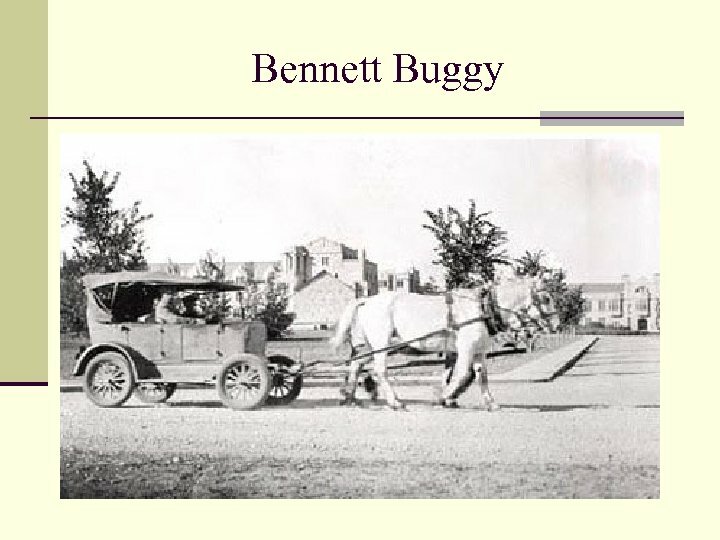 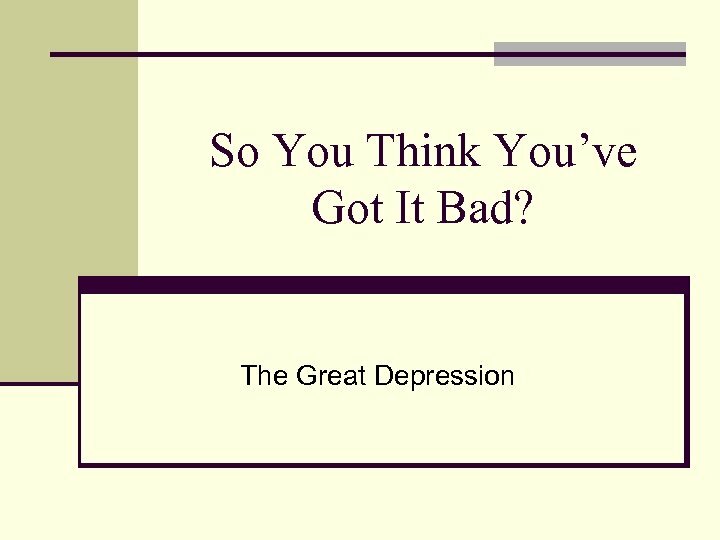 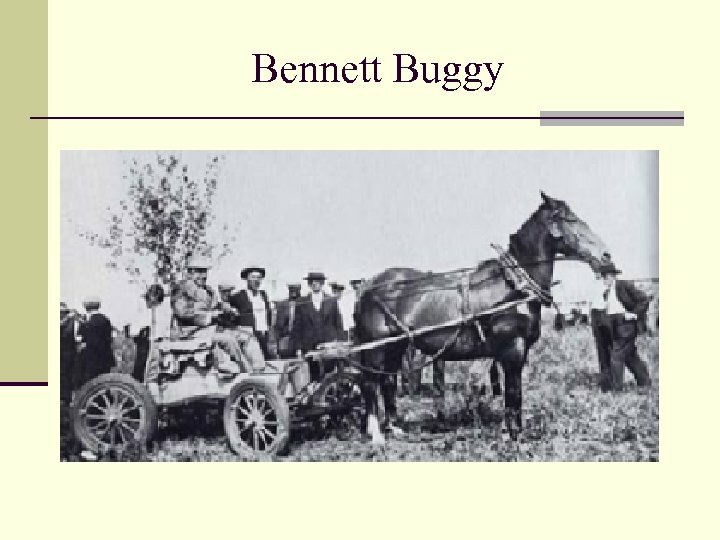 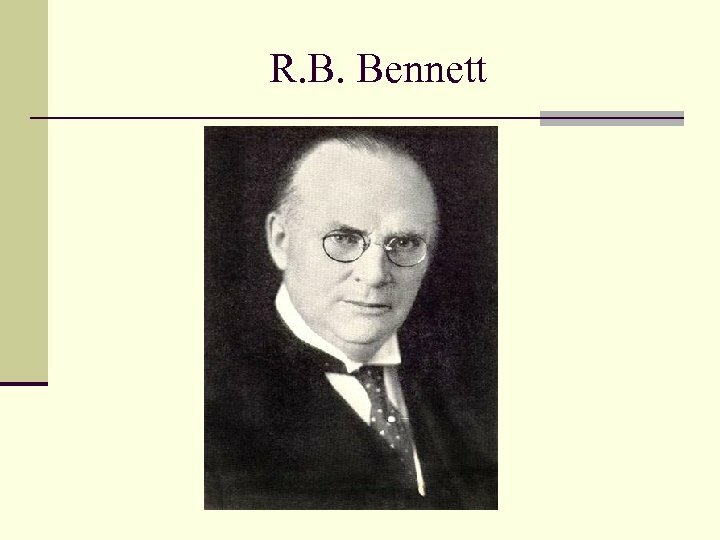 Bennett’s Response to the Great Depression n Bennett was no more in favour of relief than Mackenzie King had been. 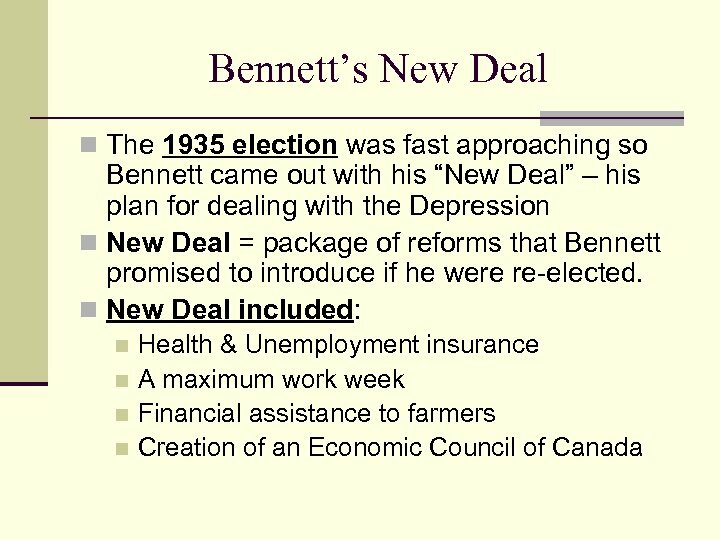 n Nevertheless, within his first five weeks in office he grudgingly passed the Unemployment Relief Act to provide assistance to the unemployed. 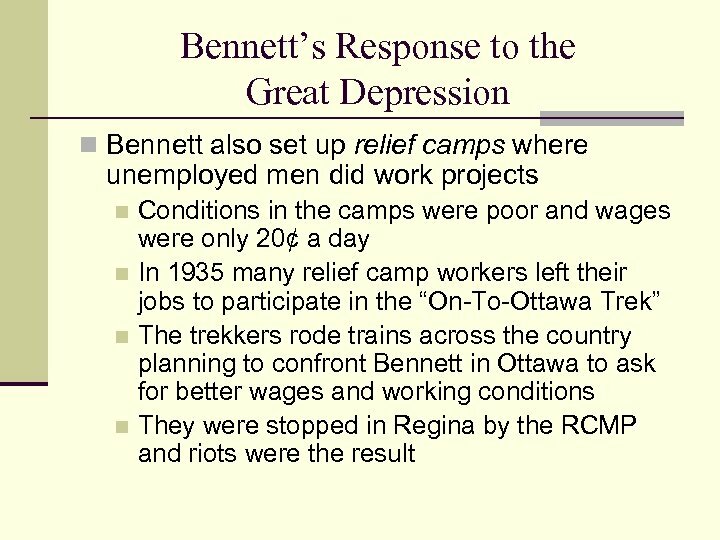 n In the end, Bennett spent over tem times more on relief than had been spent in the entire previous decade…. 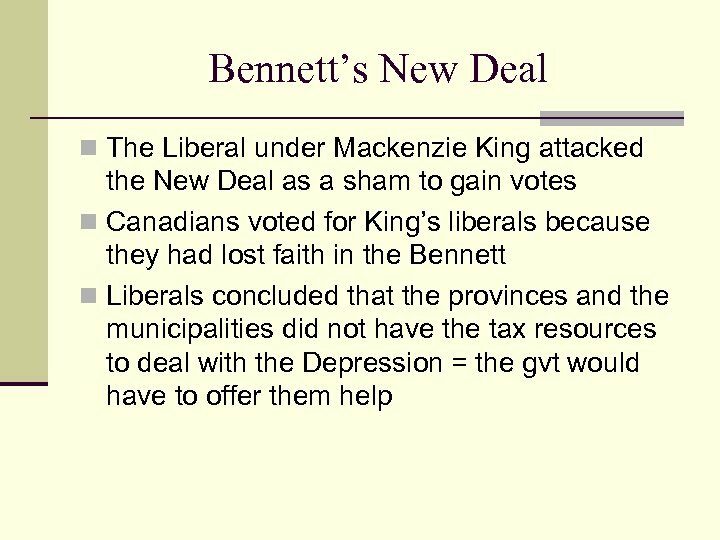 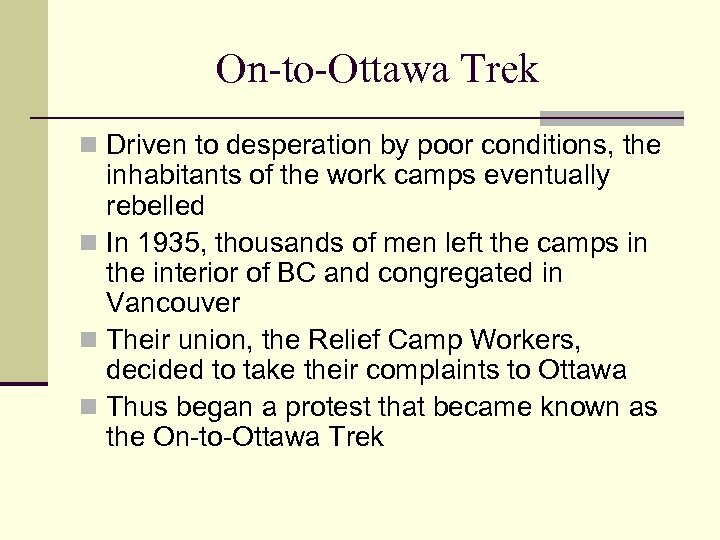 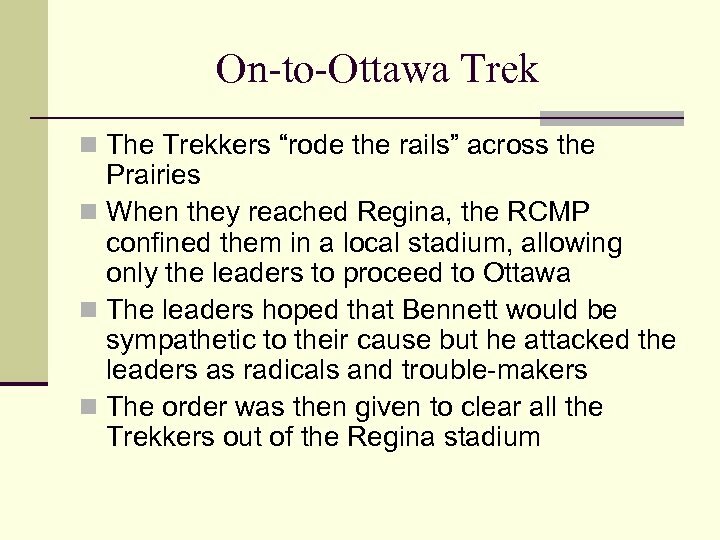 but he continued to argue that unemployment relief was a provincial or municipal responsibility rather than a federal one.